Click here to view current Women’s Birthing Center opportunities. The Women’s Birthing Center at the University of Michigan Von Voigtlander Women’s Hospital (VVWH) has 50 private rooms and handles more than 4,500 births per year. While many of these deliveries are routine and uncomplicated, we are uniquely qualified to handle cases that are complicated by maternal or fetal high-risk conditions. VVWH is a Level III Perinatal Center — which means we have specialists available around the clock to care for both maternal and neonatal emergencies and high risk patients — as well as caring for those with low risk pregnancies wishing for a “low intervention” labor and delivery process. We are honored to assist families from Michigan — as well as from across the country — in their care during this important time in their lives. 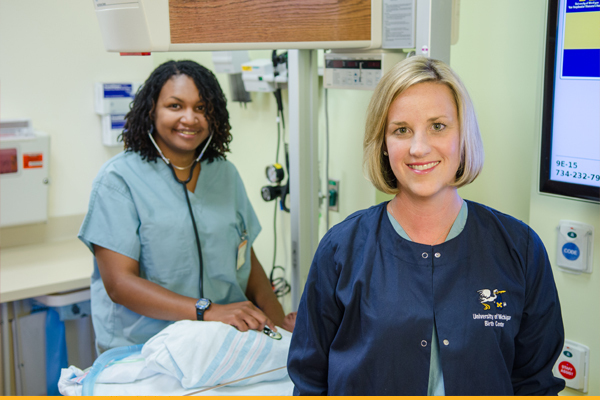 Join the talented nursing professionals in our Women’s Birthing Center, whose skill and compassion embody The Michigan Difference. The staff of the Von Voigtlander Women’s Hospital are committed to the care of antepartum, intrapartum and postpartum women and their newborns, in an environment that supports and empowers families. Low and high risk care is provided in a labor/delivery/recovery/postpartum (LDRP) setting. Common diagnoses include normal labor and birth, cesarean section, hypertensive disorders of pregnancy, preterm labor, multiple births, bleeding disorders, and congenital anomalies of the fetus.